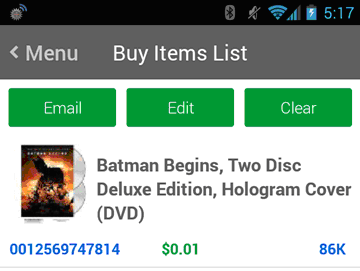 This will display the list of items signaled as ‘buy’ by the trigger or added manually by tapping on the ‘Shopping Cart’ icon. Email: Allows you to email this list as a text file. You can then import this file to our FBAListing software (Menu -> Batch) to list on Amazon. Edit: Allows you to delete one item from the list. Clear: Deletes all items in the list.